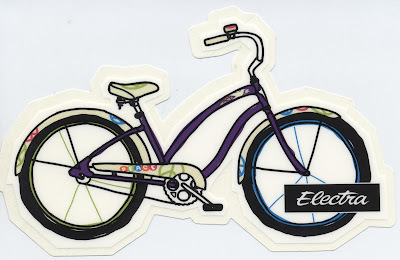 Century Cycles Blog: It's an Electra-palooza! Electra bicycles are so fun and stylish and easy to ride that it's hard not to get excited about them. But when you check out all the NEW Electra bikes, bike colors, accessories, and parts that have arrived in our stores, we think you'll agree -- it's an Electra-palooza, just in time for the holidays and for Electra's $25 rebate! Let's start with the bikes. One new model is the Electra Peace 3i (above), which shares its peaceful message with the world via its rims, chainguard, bell, seat, valve caps -- even its spokes are colored to show off a peace sign! And the Townies? Sure, they're innovative and ergonomic, but they got an even bigger dose of style with the addition of some hot and irresistable new colors like cranberry, lilac, champagne pearl, fuscia, matte sage, blood orange, and vanilla! Electra loves everything about bikes, right down to the custom valve caps. And now you can own all those little things that give your bike an extra oomph and show off your personal style. 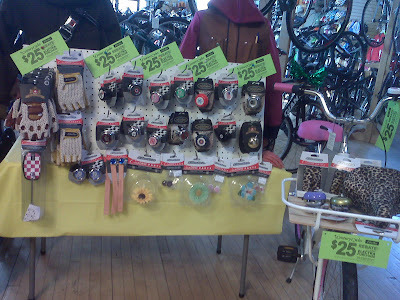 Things like bells, handlebar flowers, grips, hub shiners, saddles, mirrors, and crochet gloves! The Rocky River store has them on special display below (and has happened to notice that most folks can't resist touching the faux leopard fur saddle at right). So come on in to your favorite Century Cycles and check out Electra-palooza! We'll let you ride the bikes. And ring the bells. And touch the leopard fur saddles.